No one knows what the Senate's going to do. But it will do it today. The Senate won't know until it has already voted, later in the week, on one bill or another. And all of the available options still have major holes. But their chances of getting there seem to be improving. Stranger things have happened, but Sen. John McCain probably isn't taking a break from his brain-cancer treatments to travel 2,300 miles across the country so he can torpedo a bill about an issue he's never been especially invested in, which he could have torpedoed just as easily by staying in Arizona. If McCain is a "yes" on today's motion to proceed — and, sure, take nothing for granted, but if — then Majority Leader Mitch McConnell is in a considerably better position. Sen. Susan Collins is a "no." But it sounds like Sens. Rand Paul and Mike Lee will get their request to begin the voting with a modified version of the 2015 straight-repeal vote. If those two support the motion to proceed, it would take two more moderates to join Collins and prevent a vote-a-rama. 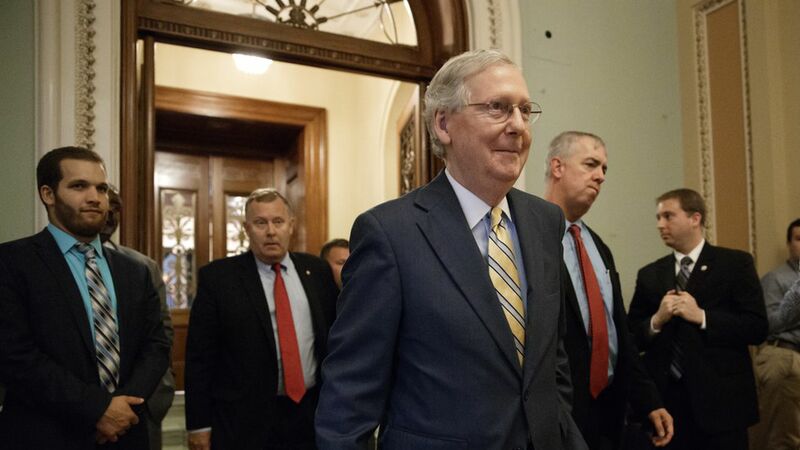 Today, McConnell will call a vote on a motion to proceed to the House-passed bill. Senate aides tell my colleague Caitlin Owens the primary substitute would probably be the 2015 repeal-only bill, with a version of repeal-and-replace offered as an amendment to that amendment. Once those 20 hours are up, the voting marathon begins — on amendments to McConnell's substitute, and on points of order to strip out provisions that don't conform to the Senate's budget rules. McConnell could also offer different substitutes during this part of the process. If and when everyone has worn themselves out, at the end of the process, they'd vote on whether to adopt the substitute amendment, including whatever changes have been made to it throughout the process; and then to pass the underlying bill. No one knows how long the process will take or how it's likely to end. Even though reconciliation is a partisan process, the particulars of using it have, in the past, relied heavily on bipartisan agreement. We asked our experts, for example, how the process ends — what's the mechanism to say a vote-a-rama is over and there are no more amendments? Usually, they have ended when the minority party either wears itself out or just agrees that after a certain point, the Senate can move on. This could all get even messier without that agreement. Per Caitlin, senators are still trying to broker compromises — including one between Sens. Rob Portman and Ted Cruz that would revive Cruz's consumer-choice proposal while adding more money to help states stabilize their markets. Those amendments, though, haven't been evaluated by CBO and therefore would require 60 votes, which means they'd fail. Key caveat: A successful motion to begin the voting process doesn't necessarily mean any of the underlying health care bills will pass. But this has been leadership's message so far: Just let us get on the bill. Each incremental victory puts another one within reach.